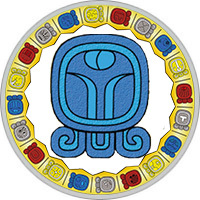 Mayan Name: B´AATZ / Chuen. Compatibility: Monkey, Eagle, Storm, Night, Deer. Mayan Sign Monkey (Chuen) — creative power, talent. The meaning of the sign is the monkey, the protector is the God of the Hunchuen monkeys. In Maya myths two twin brothers appear: Monkey and Craftsman. Talented brothers — unsurpassed masters of the arts, they are subject to any activity: singing, writing, woodcarving. Therefore, the Monkey Sign is a symbol of creative craftsmanship, spiritual strength. But this day has another — rebellious, cruel beginning. According to legend, brothers have negative character traits: envy, selfishness, self-conceit. Nevertheless, the Monkey is a happy day: the people of this sign in all matters are accompanied by luck and luck. Sociable people of the Monkey sign invariably attract attention. The surrounding people like their light, cheerful character and, importantly, the inner content. Nature has generously endowed them with talents, but often they do not use their gift for their intended purpose, or they praise themselves too much, considering themselves better than others. Narcissism, rancor — qualities that create considerable difficulties, but smart, discerning people can not always cope with the "dark" side of their nature. Perhaps, the main and most valuable gift of representatives of this sign is luck, they are born for a happy life. There is no need to overcome obstacles, work hard and work hard, all desires are easily fulfilled, you just need to. Talented people of the Monkey sign know how to dispose of their outstanding abilities. Creatively gifted natures are recognized masters of the arts: singers, musicians, artists, actors. But they are subject to other activities, for them there are no barriers, except their own laziness. Too sure of their importance, they often neglect their duties, as a result — the collapse of their careers. Despite the luck, it is necessary to make efforts and work every day, only in this case the people of the Monkey sign are waiting for success. Love inspires and inspires the person of the Monkey. It was during this period that he was experiencing a creative upsurge, moving significantly up the career ladder. Demonstrates his best qualities: tenderness, sensuality, loyalty. Romantic person with all the passion immersed in the relationship, literally deifies the object of love. Thanks to his natural luck, he chooses a worthy partner whose marriage lasts for many years, often until the end of his life. But it happens jealous and rancorous, does not forgive one half of the slightest oversight. Quite often in a happy family flare up scandals, but conflicts necessarily end in stormy reconciliation. A charming, physically attractive man of the Monkey sign is of great interest to women who are dreaming of getting married. A cheerful, emotional person has the ability to give a good mood. Talent, luck, diligence are the components of his success. A financially secured person does not spare money for gifts, often arranges surprises. For close people he does not make strict demands, just waiting for admiration. The woman of the Monkey is a coquette, some consider her a frivolous person. Creative nature is in a captivity of dreams and fantasies, is not distinguished by economic and practicality. In difficult life situations, it invariably benefits from natural luck. Happily lives life surrounded by close people. Often rushes from the extreme to the extreme: quickly ignites the idea and instantly cools. Just a couple of days ago, she was talking about a career on the stage, today she wants to go on a sea cruise to write from nature. Strives to find a strong, reliable partner who can wisely guide her through life.